In recent columns we have tracked down and analyzed possible explanations or responses to the following perplexing question: Why has total acreage planted to major crops not changed in response to the thirty to forty percent drop in crop prices of recent years? Several pieces to the puzzle are evident. First, planting flexibility is great for adjusting the mix of crop acreages but it is of little help in adjusting total crop acreage in response to general declines in all crop prices. Secondly, in terms of impact on total acreage planted to major crops, it seems to make no difference whether government payments are coupled or decoupled. What this could mean is that farmers consciously or unconsciously adjust price expectations to reflect the added value of the decoupled payment. If that were true, it could be that these expected prices, unlike market prices, have not declined since 1996. Thus, the observed slight change in total crop acreage since 1996 would not only be understandable, it would be expected. Let’s look at the data and see. To examine this hypothesis, we computed the payment-adjusted price for each of the four crops (corn, cotton, soybeans and wheat) by dividing the sum of the crop’s value of production, AMTA payments, and any market loss payments by the crop’s production. The crop’s value of production was computed using the season average price or the loan rate, which ever is greater. 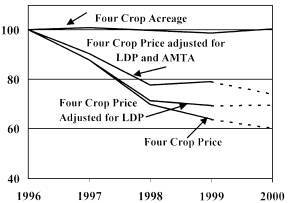 The resulting composite payment-adjusted price index for the four crops is shown in figure 1. As you can clearly see, per unit payments, which include AMTA and market loss payments when paid, have not offset the price declines since 1996. Thus we can conclude that the lack of downward adjustment in total planted acreages of major crops since 1996 is not fully explained by the lack of change in payment-adjusted prices. This full payment-adjusted price index for the four crops declined by 21 percent between 1996 and 1999. While this reduction is less than the corresponding drop in the season average price index (36%) and the season average price index computed with the loan rate floors (31%) the conclusion is still the same: total acreage of the four major crops has NOT responded to the sharp price declines of the past four years. So the question remains: Why does total crop acreage not change when prices drop? In my experience, the short answer is that as long as farmers can scrape together enough money to get a crop in the ground, get it in the ground they will! Those farmers who can’t finance another year of crop farming turn their land over to other farmers—either voluntarily or involuntarily. Either way, the land remains in production. Or more precisely, remains in production over a broader range of crop prices than we have seen to date. Payments, whether coupled or decoupled, become part of the pile of money farmers use to operate their farms. When viewed this way, it makes no difference whether or not government payments are decoupled from production because production is never decoupled from payments. For an individual producer, production is no more decoupled from government payments than it is from any other source of operating capital, including cash balances from market sales, lines of credit at the bank, or off farm employment.